The iris is the colored part of the eye. It is made up of two layers. The outer “stroma” can be blue, hazel, green or brown. The back layer (the iris pigment epithelium) is always brown. Tumors can grow within, through and thus behind the iris. This tapioca-colored iris tumor has pulled the iris pigment epithelium out onto the surface of the iris stroma. Iris melanoma patients usually have no symptoms. The tumor might be noticed by the patient, their family, or by the eye care specialist (during a routine eye examination). Some people have lots of freckles on their irides. Some of these pigmented spots have thickness and are called Nevi. If the patient notices that one of their nevi has changed, enlarged or is pulling (ovalization) on the pupil; they should see an eye care specialist for evaluation and referral to an eye cancer specialist. Ultrasound shows diffuse iris thickening of the iris stroma with bowing and invasion of the underlying iris pigment epithelium. future comparisons. High frequency ultrasound is used to examine and measure the iris tumor. Ultrasound can reveal if the tumor is cystic or solid, how it extends within the iris and ciliary body. Ophthalmic oncologists use high frequency ultrasound measurements to evaluate iris tumors for evidence of growth or regression after treatment. Characteristics that suggest that an iris tumor is cancerous include seeing blood vessels within the tumor (intrinsic vascularity), secondary glaucoma, evidence that the pupil is deformed (ectropion uveae), and the development of a cataract beneath the tumor. 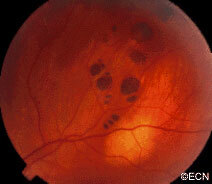 Some eyes may have enlarged “sentinel” blood vessels on the white of the eye (sclera) in the quadrant of the tumor. The most important finding is documented growth. Since iris melanomas are commonly small, and less commonly (10-11%) spread to other parts of the body, these tumors are often watched for evidence of growth or change before biopsy or treatment is considered. A small amount of growth is not thought to significantly affect the rate of metastasis from a small iris melanoma. When necessary, eye cancer specialists can biopsy an iris tumor to help determine if the tumor is benign or malignant. 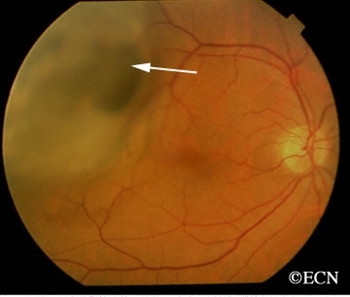 A diffuse iris melanoma causing severe glaucoma was treated by enucleation. At The New York Eye Cancer Center, we usually treat these cancers with eye and vision-sparing plaque radiation. Most pigmented iris tumors do not grow. They are photographed and monitored with periodic observation. When an iris melanoma is documented to grow, we know that it can damage the eye, cause secondary glaucoma and spread to other parts of the body. Then treatment risks become more acceptable to the patient. At The New York Eye Cancer Center, we typically use plaque radiation to destroy iris and iridociliary melanomas. This treatment allows for preservation of the iris, the pupil and does not cloud the cornea. We have found that the most common complication is cataract and permanent vision loss is rare. Though most small iris melanomas can be surgically removed, however iridectomy may cause glare and astigmatism. The function of the iris and size of the pupil are better preserved if the tumor is destroyed with plaque radiation. Though many of these tumors can be surgically removed, plaque or proton radiotherapy should be considered as primary treatment for these tumors. Though a radiation cataract is likely to develop, due to the distance between the radiation and the macular retina, vision limiting radiation retinopathy is very unlikely. These cases can often be difficult to treat with either surgical removal or eye-sparing radiation therapy. Cure for these tumors is likely to require removal of the eye. Sometimes the entire iris is filled with melanoma. In these cases, removal of the eye is a reasonable option. However, there has been a recent trend towards and our experience that eye and vision-sparing radiation of the entire front of the eye (anterior segment) can be used to control the tumor, spare vision and allow the patient to keep their eye. Melanocytoma is a form of nevus that can occur in and behind the iris in the ciliary body. In the image seen below, this melanocytoma has a cobblestone textured surface and feathered margins. Interestingly, it is also causing a small amount of pupillary distortion (correctopia). Bits of iris melanocytoma can break off and settle in the inferior angle. These sedimentary melanocytoma cells can clog the natural drain of the eye (trabecular meshwork), causing increased eye pressure (glaucoma). Melanocytoma tumors can grow, malignant transformation is rare and metastasis is reportable. Most patients with iris melanocytoma can see a dark spot on their iris, and have no other symptoms. Patients can have pigment dispersion, secondary glaucoma and intraocular inflammation (iritis). Secondary glaucoma can either be asymptomatic, cause one-sided (ipsilateral) headaches and cloudy vision (with halos around lights). Iris melanocytoma can be diagnosed by clinical examination. The tumor tends to be dark brown to black and the edges feather-shaped. The surface can be cobblestone (bumpy) appearance or smooth. Melanocytoma pigment can speckle the iris surface and deposit in the anterior chamber angle. Examination of the inferior angle by gonioscopy reveals deposits of melanocytoma pigment. High-frequency ultrasound is particularly helpful for the diagnosis of iris melanocytoma. This technique is used to evaluate the depth of penetration into the iris and surrounding tissues. It can also be used to monitor for growth. These tumors can extend through the iris and into the ciliary body. 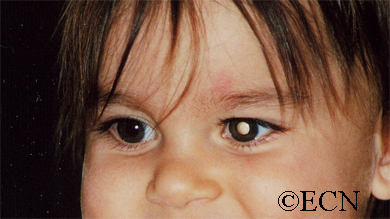 Unlike low reflective iris melanomas, they tend to appear bright (highly reflective). Transverse oriented 20 MHz high-frequency ultrasound demonstrates its cobblestone-shaped surface. Iris melanocytoma does not usually require treatment. High-quality slit-lamp and gonioscopic photographs should be taken to record the appearance and surface characteristics of the tumor. High-frequency ultrasound should be performed to evaluate its thickness and extension into surrounding structures. These evaluations will be used to monitor for growth. Careful attention should be made to measuring intraocular pressure. Secondary glaucoma can occur due to pigment that clogs the natural drain of the eye (trabecular meshwork). Patients should keep a copy of these baseline tests in case they move to another area or their doctors change. Should an iris melanocytoma be found to grow, an iris biopsy can be performed to determine if it is benign or malignant. When possible, rapidly growing and malignant iris melanocytomas whould be surgically removed. If resection is not possible, they can be treated with relatively high-dose plaque radiation therapy. Secondary melanocytomalytic glaucoma can be treated like other glaucomas. It is reasonable to consult with a glaucoma specialist. Strenuous exercise may “shake-up” the intraocular pigment and cause a temporarily increased eye pressure. When this happens, patients may notice headaches or cloudy vision after exercise. If glaucoma surgery is recommended (e.g. trabeculectomy, stent, valve), a tumor biopsy can ensure that the tumor is not a melanoma. (See Innovations Section – Finger Iridectomy Technique). Cysts can form in different parts of the iris and ciliary body. Most remain undetected, unless they push on the iris or get relatively large. The most common is the neuro-epithelial iris cyst, which is typically located beneath the iris root. Cysts can also be located in the ciliary body, the iris stroma, and be formed by splitting (schisis) of the iris pigment epithelium). These cysts can push the iris forward, appear as a mass or tumor and may cause angle closure glaucoma. 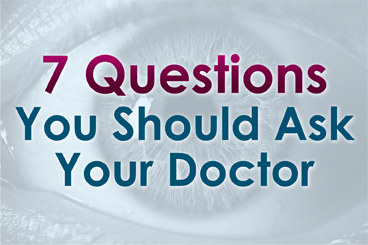 Almost all iris cysts are located behind the iris and cause no symptoms. They are found by the eye care specialist during ophthalmic examination. Iris stromal cysts can become visible on the surface of the iris. Most commonly, the eye doctor sees a bulge in the iris stroma and considers that a tumor may be pushing it forward. At that point, the doctor may send the patient for an ocular tumor evaluation (to look behind the iris with ultrasound or OCT imaging). Most iris cysts can be diagnosed by clinical examination with high-frequency ultrasonography. Large cysts can be seen by routine slit-lamp examination. High frequency ultrasonography reveals internal echolucency consistent with the diagnosis of iris stromal cyst. This iris stromal cyst extends from the iris stroma onto the corneal endothelium. Though cysts are benign, periodic observation is necessary due to the rare instances of secondary angle closure glaucoma (only seen with giant cysts, multifocal cysts and iris schisis cysts). Slit-lamp photograph of an Iris Pigment Epithelial Cyst. Note its smooth, rounded surface. High-frequency ultra-sonography of a neuro-epithelial iris cyst. Note anterior displacement of the iris with focal angle closure. High-frequency ultrasonography (aka UBM) has revolutionized our ability to image and thus “see” tissues behind the iris. It has allowed for evaluation of tumor thickness, depth of penetration, and invasion of adjacent tissues. Ultrasounds ability to determine if a tumor is solid or cystic has been particularly helpful. Most iris cysts do not require treatment. Treatment is performed for the rare instances of secondary glaucoma or when the visual axis (pupil) becomes blocked. Laser has been used to deflate iris pigment epithelial cysts with minimal side effects. The natural history of iris cysts has not been determined. In my experience, some get smaller, some get larger and most stay the same. Until eye care specialists understand which cysts will grow, periodic observation is warranted. Intraocular metastasis is the most common malignant intraocular tumor and may occur in as many as 10% of patients with metastatic cancer. Most of these tumors go undetected unless they affect vision and become symptomatic. Metastatic breast cancer is the most common in women and lung is the most common in men. Other primary sites include prostate, skin, kidney, colon and thyroid. Leukemia and lymphoma also occur in the eye. Less than 10 percent of intraocular metastatic tumors are located in the anterior part of the eye. Most patients with iris metastasis present either with a visible cance (see photographs) or tumor-related “secondary” glaucoma. Glaucoma can cause foggy vision, halos around lights and headaches (brow aches). These “symptomatic” patients that come to or are sent for ophthalmic examination. Most iris metastasis patients either have a history of cancer or are found to have a primary source of the tumor (on systemic examination). It is important to perform complete systemic survey when intraocular metastasis is suspected. This examination should include radiographic imaging (staging). The New York Eye Cancer Center protocol involves whole body, scalp-to-toes PET/CT. The reason is that though most intraocular cancers come from the lung and breast, there exist multiple less common “source” primary cancers. PET/CT evaluates the entire body. Consultation with an adult or pediatric medical oncologist should be obtained. Advanced anterior iris and ciliary body metastases can be difficult to manage. Radiation therapy alone or in combination with intraocular anti-VEGF drug therapy may be used to control the tumor, protect vision and conserve the eye. If left untreated, metastatic cancer in the iris can cause glaucoma and a blind painful eye. Thankfully, symptomatic anterior segment metastases are much less common than choroidal metastasis. When the diagnosis of intraocular metastasis is made or suspected, eye cancer specialists always dilate and examine both eyes. This is because metastases can be both bilateral and multifocal. Computed tomography or magnetic resonance imaging of the brain and lungs should be performed due to a high incidence of concurrent metastases.